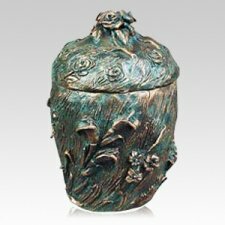 The Garden Wheat and Roses Patina Bronze Urn crafted using the age old "lost wax casting" technique that gives the solid bronze piece the texture and detail of a traditional ceramic urn. Unlike a ceramic urn, however, this piece is suitable for outdoor display. Top opening threaded lid, could be sealed with adhesive. "This website was recommend by a friend in the cremation business. It was a lot cheaper then things you could by at the funeral home. The necklace is beautiful in person and suited my needs."